Nina Simone was one of the most dynamic musicians, songstresses and artists of her time. Her unwavering and unflinching devotion to the Civil Rights Movement, using her remarkable and gifted abilities, helped to redefine the power of Black women as social change agents here in the United States and around the world. A true lyrical storyteller, The High Priestess of Soul’s ability to command the undivided attention of even her worst enemies, made her an undeniable force to be reckoned. She not only redefined musical jazz standards, images of what constituted “real” beauty, but, most importantly, created a new norm by which Black women produce cultural and societal revolution. Though Nina is no longer with us today her legacy, unlike so many others, has not been forgotten. People continue to speak her name, speak of the work she fashioned, her sense of style and so on. They speak her name. They speak her name. They remember Nina and they teach others to remember her too. Unfortunately, however, the countless others who have come before Nina or created change in their own way, like Nina, have been forgotten. No one speaks their name and no one remembers to teach others about their unrelenting bravery to be Black, female and socio-cultural revolutionaries. In speaking into existence those names that have been erased from our memory, I speak Vivian Malone Jones. Born in Mobile, Alabama in 1942, Jones grew up to become one of the first Black women to desegregate one of the South’s most racially charged public schools. It was there at the University of Alabama that the now infamous Governor George C. Wallace, blocked the entrance of the school’s auditorium, in a defiant attempt against the government to prohibit the integration of Black folks into his state’s all white educational institutions. 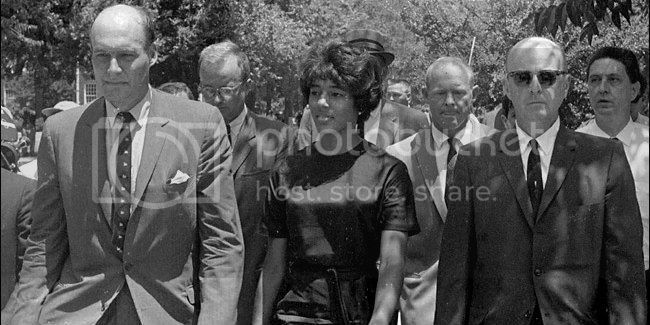 However, with the aid of President John F. Kennedy, neither Wallace nor his military guards could prevent the graceful and dignified march of Malone (and one other fellow student, James Hood), into the auditorium that day for registration of admission into the University of Alabama. Malone’s determination to stand steadfast in the beliefs that Black folks have the right to be educated equally on the same grounds and in the same halls that their forefathers and mothers built, is why we—why I, speak her name. Black women like Malone changed the course of history by exhibiting an unrelenting radicalness to see through to the end that which they had started. It is because of her that I, and so many other Black women and men, have the opportunity to pursue higher learning across these United States. It is important for all of us to continue to speak the names of those who have come before us, lest we forget how we came to be. I speak your name Vivian Malone Jones. I speak your name because while you may be gone from this earth, you are definitely not forgotten.